Based on the thrilling theme of Voodoo dolls and Voodoo magic, Net Entertainment’s (NetEnt) Voodoo Vibes features scatter payouts of up to x100, free spins with tripled wins, and a delightful pick-and-choose bonus game, in which players can win really big prizes. Playing Voodoo Vibes is really simple. The slot has 25 paylines, and players should first choose the number of lines they would like to play. They can bet up to four coins per active payline and choose from a coin denomination range of $0.01 to $0.50. This means that players can bet as little as $0.01 to as much as $50.00 per spin of the reels. Like all NetEnt slots, Voodoo Vibes also comes with a Skill Stop Feature and an Autoplay Feature. Players can use the former to stop the reels in mid spin. The latter allows them to set the game to spin automatically. Voodoo Vibes has nothing much to do with Voodoo. In fact, it is a light-hearted approach to the dark arts. As a result of this, Voodoo Vibes has turned out to be an entertaining and colorful slot, the reels of which feature icons of charms, crosses, roosters, skulls, Voodoo Man, Voodoo Woman, potions, and others. The wild icon for Voodoo Vibes is the Voodoo Man. Players can use this wild to complete winning combinations and grab extra payouts as it can substitute for all other icons across the reels except the scatter icons and the bonus icons. The Voodoo Man wild also helps players win the top fixed jackpot of 7,500 coins. Players only have to spin a combination of five wilds along an active payline. If they manage to spin only four wilds along an active payline, they will receive the second-biggest fixed jackpot of 2,000 coins. Since the Snake icon is the scatter, combinations of snake icons can help players win prizes even if they do not land along an active payline. If players land 2, 3, 4, or 5 Snake scatters anywhere on the reels, they will win attractive scatter payouts of x2, x4, x25, or x100 their original bet amounts. Players should get at least three Snake scatters on their reels in order to trigger the free spins round. If players do this, they will receive 10 free games with tripled wins. This feature can be re-activated while playing a free game. If players hit a combination of at least three Voodoo Doll icons, the Voodoo Doll Bonus Game gets activated. Players will then be prompted to click on Voodoo dolls to win attractive bonus prizes. If players click on an empty Voodoo doll, they will be returned to the base game as the bonus game round will end. 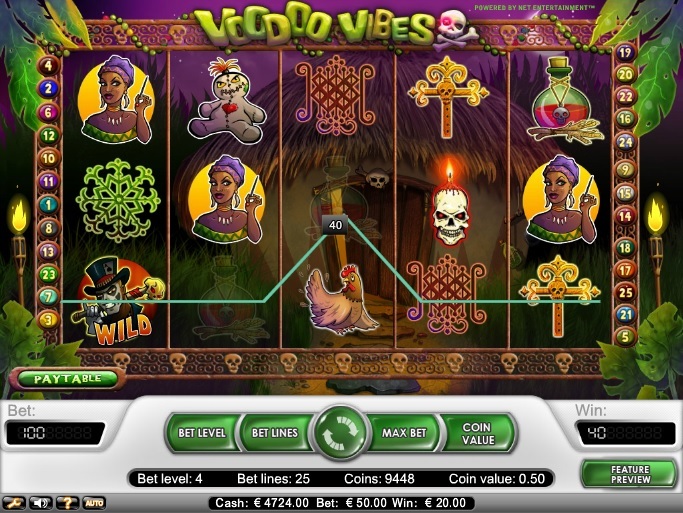 Voodoo Vibes is available at any NetEnt-powered online video slot.